Art Directors and Designers rejoice! No longer do you have to deal with snooty, precious and downright smelly copywriters to flesh out the content of your next project. 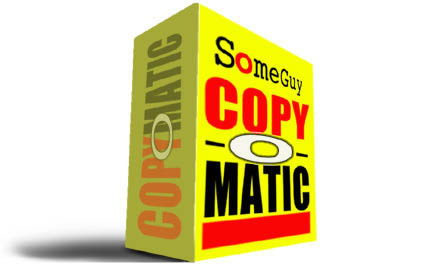 We are excited to be able to release SomeGuy's Copy-o-Matic, patented automatic copywriting software. Finally art directors and designers everywhere can instantly create grammatically and politically correct copy to add to their layouts, flyers and brochures. Simply enter the key words associated with the product or service, choose the exact number of words, press the Go button and SomeGuy's Copy-o-Matic does the rest! It's the sure-fire, no fuss way to fill all those unsightly gaps with text. This of course, is all a lie. If you just want words to fill a text box, you won't find them here, so let's move along. However, if you recognise real creative genius, then you've come to the right place.